In a leave-no-prisoners battle in Top 16 Group F, Fenerbahce Ulker Istanbul registered a good-as-gold road win by downing CSKA Moscow 75-81 in the Russian capital on Friday. The two teams are tied for second place in the group with 6-2 records, though Fenerbahce is ahead via tiebreaker. 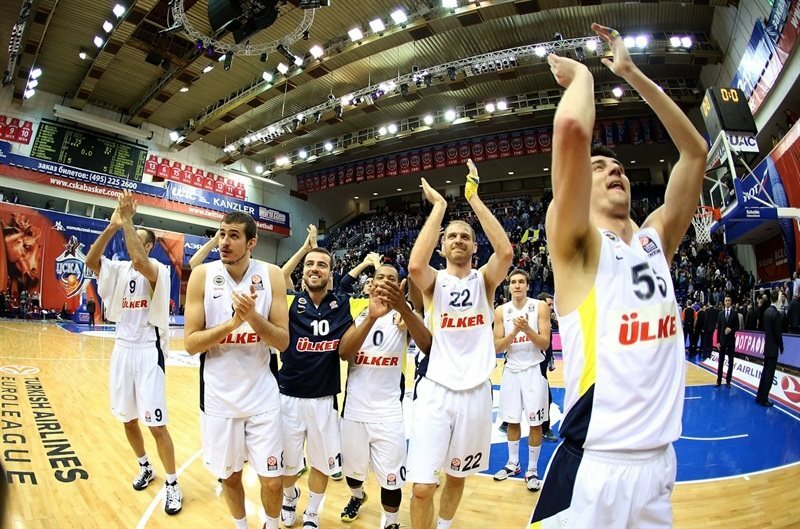 Andrew Goudelock and Jan Vesely led the winners with 14 points apiece. Bogdan Bogdanovic added 13 while Nemanja Bjelica tallied 11 points and 13 rebounds for Fenerbahce, which won its seventh straight road game. Nando De Colo led CSKA with 18 points. Milos Teodosic added 14 before being disqualified in the final minute, Sonny Weems scored 13 amd Aaron Jackson 10 for the hosts, who suffered their first home loss in the 2014-15 Turkish Airlines Euroleague season. 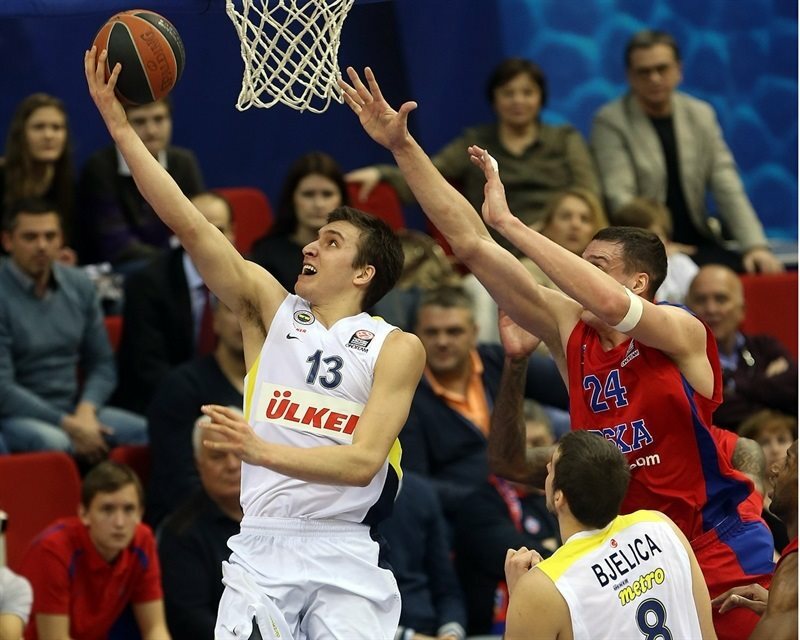 Bjelica had 6 points in an opening 0-10 run, as Fenerbahce held CSKA scoreless for more than five minutes. Weems stepped up for CSKA, but a buzzer-beating triple by Bogdanovic gave the guests a 10-17 lead after 10 minutes. Back-to-back triples by Goudelock boosted Fenerbahce's lead to 27-35. De Colo led a 10-1 run which Andrei Kirilenko capped with a layup for a 37-36 CSKA lead, but Bogdanovic and Vesely restored a 37-39 Fenerbahce edge at halftime. Back-to-back baskets by Vesely saw Fenerbahce regain the lead, 58-59, at the end of the third quarter. 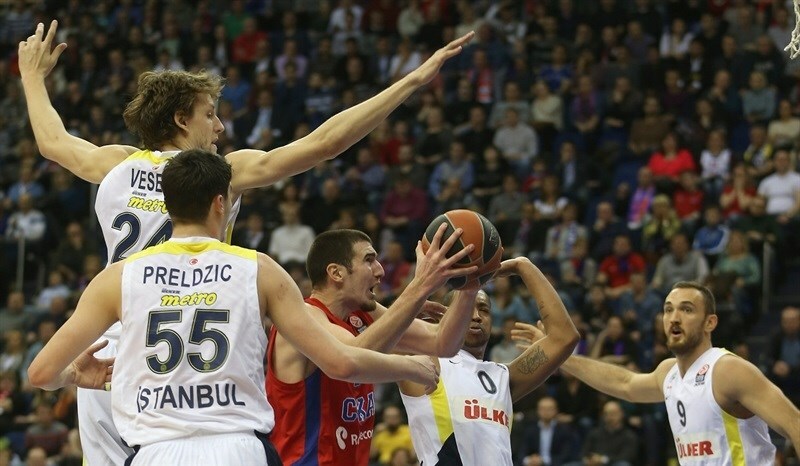 It all came down to the final three minutes, as free throws by Luka Zoric gave Fenerbahce a 69-71 lead. A put-back slam by Vesely and free throws by Bjelica and Bogdanovic sealed the outcome down the stretch. Bjelica got Fenerbahce going with a three-pointer from the left wing. A layup by Oguz Savas and a driving basket by Goudelock soon gave Fenerbahce a 0-7 lead. CSKA called timeout and tried a new backcourt with Teodosic and De Colo together, but the hosts kept struggling to score. A three-point play by Bjelica capped a 0-10 Fenerbahce start. 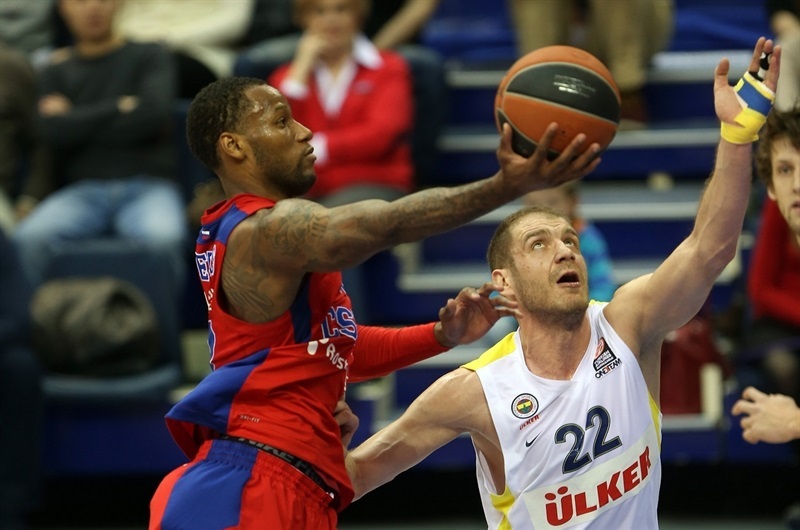 CSKA missed 10 consecutive shots until Weems nailed a five-meter jumper. 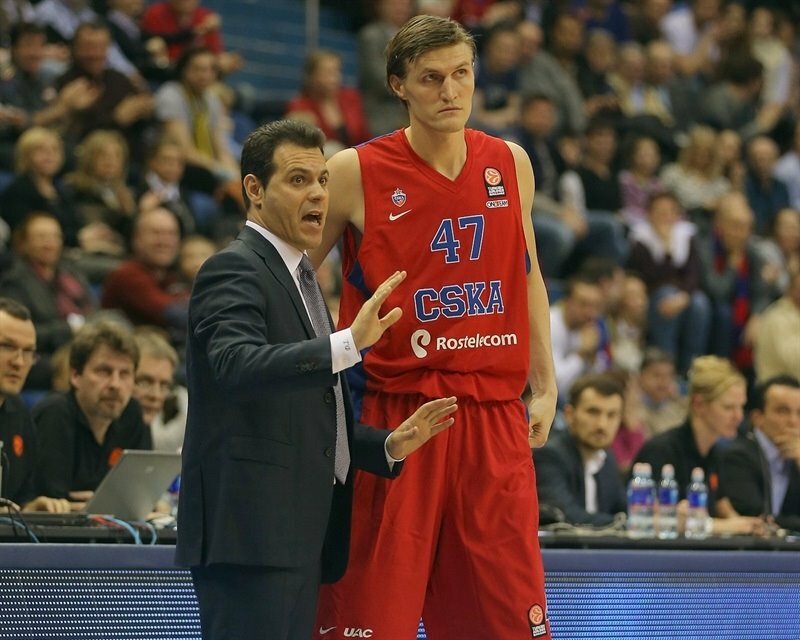 CSKA improved its defense and did not allow any open shots. A free throw by Kyle Hines brought the hosts within 7. Weems ignited the crowd with a two-handed slam, before Ricky Hickman and De Colo traded free throws. A mid-range jumper by Emir Preldzic made it 7-14. Teodosic struck from downtown, but Bogdanovic beat the buzzer with his own triple for a 10-17 Fenerbahce lead after 10 minutes. Vesely downed a running hook early in the quarter, which Teodosic bettered with his second three-pointer. 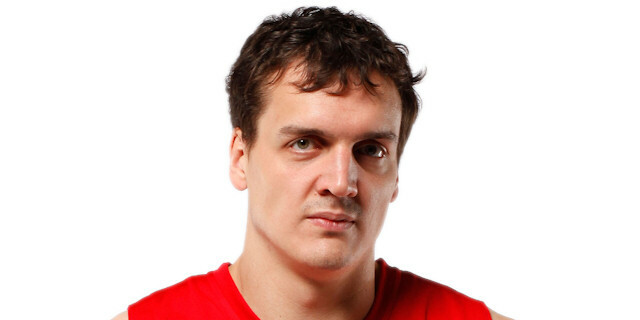 Luka Zoric nailed a five-meter jumper, as the game turned into a physical battle. Weems beat the shot clock with a driving layup, which Hickman bettered with a wild three-point play. Sasha Kaun split free throws and Weems buried a three-pointer in transition after which Fenerbahce stopped the game at 19-24. Bogdanovic took over with a reverse layup, but Demetris Nichols hit one from beyond the arc to bring the hosts within 22-26. Hickman answered from downtown, but a layup-plus-foul by Kaun kept the hosts within 4. Goudelock joined the three-point shootout with back-to-back triples that caused CSKA to call timeout at 27-35. De Colo hit a three-pointer and a dunk by Kaun brought the hosts as close as 32-35. After De Colo made 3 free throws, Vesely split a pair from the line. 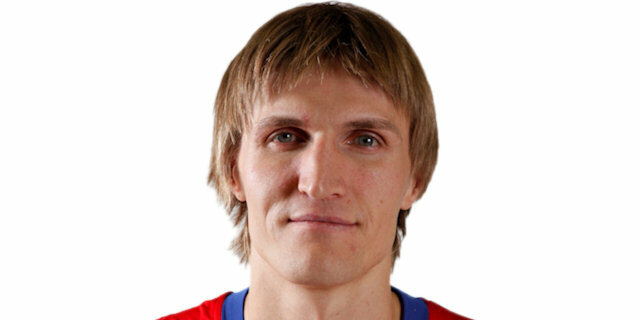 A layup by Kirilenko gave CSKA its first lead, 37-36. Free throws by Bogdanovic and Vesely made restored Fenerbahce’s lead, 37-39, at halftime. Weems sank a jumper off the dribble immediately after the break. Bjelica quickly answered with a close basket, which De Colo erased with a backdoor layup to tie it at 41-41. 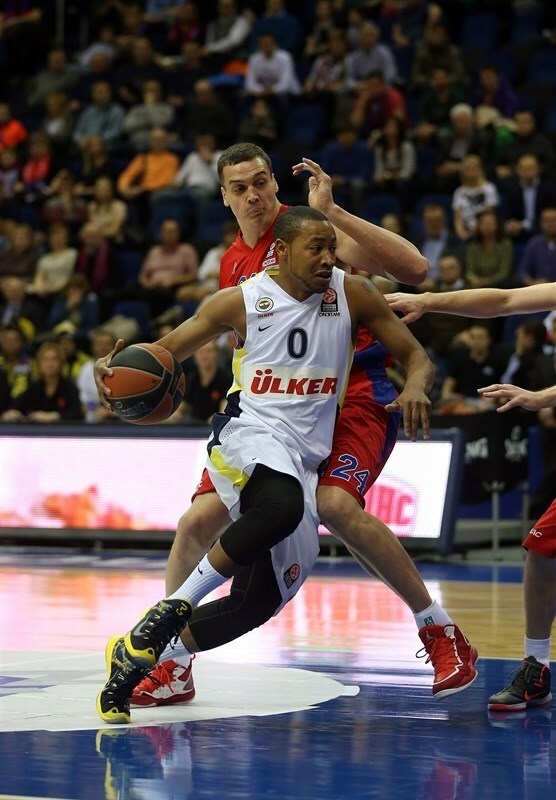 Predlzic scored around the basket and a three-pointer by Goudelock gave Fenerbahce some fresh air at 41-46. Kaun dunked again, but Goudelock hit a one-handed floater. Free throws by Teodosic kept CSKA within 3. De Colo followed a turnaround jumper with a fast break basket to put the hosts back ahead, 49-48. After Teodosic hit free throws, a three-pointer by Preldzic tied it at 51-51. De Colo and Teodosic kept pacing CSKA with foul shots, but Semih Erden shocked the crowd with a one-handed slam and kept his team within 1. Jackson scored down low, but back-to-back baskets by Vesely gave his team a 58-59 edge. Fourth quarter: Down to the final two minutes! Jackson shined with a fast break layup early in the quarter. Erden dunked again, but Teodosic found Jackson for backdoor layup and a 62-61 CSKA lead. Zoric took over with a tip-in that De Colo matched with a driving layup. Fenerbahce started to miss open shots right when it mattered most and free throws by Teodosic boosted CSKA's margin to 67-63 midway through the quarter. Bogdanovic rescued the guests with a bomb from downtown and Vesely provided a highlight with a power layup - and the free throw that came with it – for a 67-69 Fenerbahce lead. 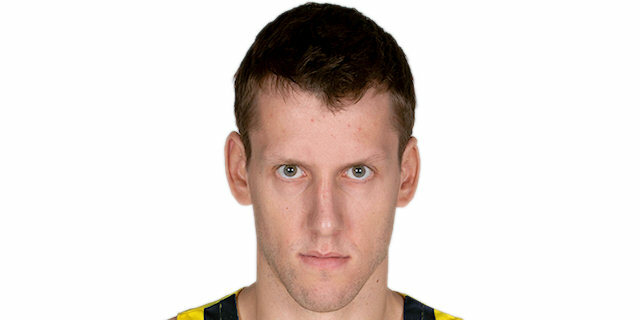 Vorontsevich hit a close jumper, but free throws by Zoric restored a 69-71 Fenerbahce lead with over two minutes left. Weems scored in penetration, but Vesely answered with a wild put-back slam. Hines and Goudelock split free throws, before Teodosic was disqualified with 45.6 seconds left. Foul shots by Bjelica and Bogdanovic sealed the outcome at 72-78. "It was a tough game as we expected. We had a bad start offensively and defensively which cost us. We played good second and third quarters, but that was not enough in the clutch moments, we weren’t concentrated enough, we shot the ball really bad, our important players had a really bad percentage on twos and threes. We gave up too many second chances to Fenerbahce Ulker, so they deserved to win." "It was a tough and important game. 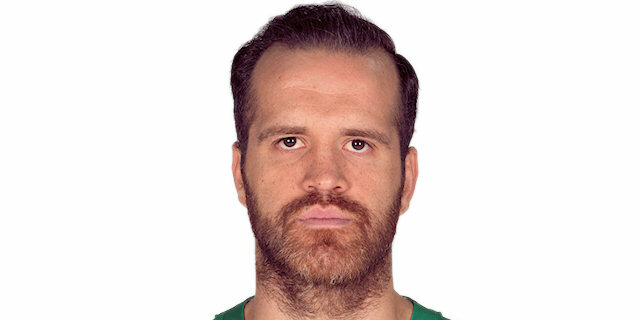 Before we came here, I said that CSKA now is probably the best team in Europe by the results and the quality of the game. Even this game does not change my opinion, I still think CSKA is the favorite to win the Euroleague. Something which is really satisfies me is the way we played; it does not matter win or loss, I would like to see my team playing like this all the time, to trust in our abilities. In Istanbul both teams had the chance to win the game, now we were more lucky. We will continue to fight and we will see how the Top 16 ends." 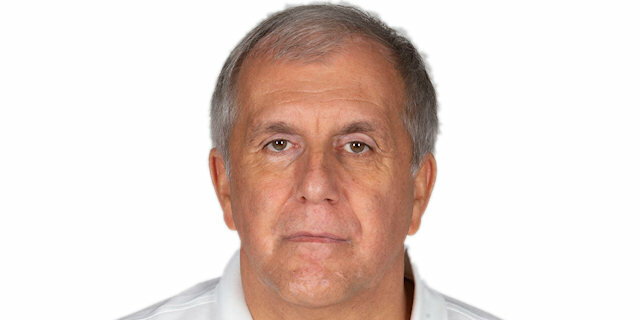 "Today Fenerbahce showed better basketball, they wanted to win more than we did. Maybe we had lack of desire. One of the reasons we lost is rebounding. Now we need to watch this game, make conclusions and play better. " "The game was equal for almost 30 minutes. In such games if you lose on rebounds – you lose the game. It was the key. It’s a pity that Nando got the fifth foul in the end because he was our engine tonight. " "This game was important for us, it was crucial because we needed to win today. We fought till the end and I think it was the best thing for us. It was tough game, but we did not give up. We started the game very well, but CSKA came back again and again. Of course they are a very good team and they just made small mistakes. I hope we will keep winning. " "It was a tough game. CSKA is the best team in Europe, so it was hard to play against them many times. I think we did a great job fighting under both baskets, and we got the win, so everyone is happy. Everybody is just trying to do our jobs and fight for the win. This is a team win."